After last year's success on OtakonEK, Enchanted Kingdom, the country’s first and only world-class theme park proudly presents to everyone Otaku Kingdom. Once again Otakus including animé, manga enthusiasts, movie lovers, toy hobbyists and cosplayers are invited on this special event in Enchanted Kingdom to enjoy park's amusement attractions and rides. Guests wearing a full otaku costume can enter the park for FREE with a Carousel Special Pass. Tickets can be upgraded to Regular Day Pass for a fee of P250. A registration area will be available at the Park’s Front Gate on September 27 from 10:00AM to 5:00PM. You may also pre-register at www.otakingdom.blogspot.com. Other events lined up for the day are toy ; manga exhibits, film showings, drawing & gaming contests, animé bands, Woodstock, the much-awaited grand cosplay contest and parade in the afternoon. Also Enchanted Kingdom is turning 14 this October! Elimination rounds for the Fireworks Competition will be on October 3, 4, 10, 11, 17 and 18 with the astounding Grand Fireworks Wizardry Finals on October 24. The skies of Santa Rosa, Laguna will be all aglow during the Anniversary Night! Come to Enchanted Kingdom where the magic stays with you! From September 3 up to December 18, we are open from Thursdays to Fridays from 12NN to 7PM. and Saturdays to Sundays from 11AM to 9PM with Fireworks Display at 8PM. 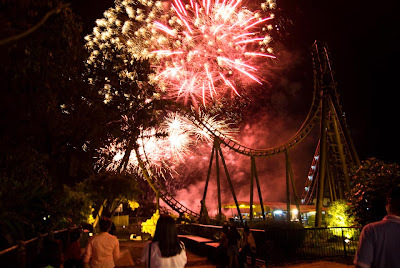 Enchanted Kingdom is located at the City of Santa Rosa, Laguna. For more information you may visit www.enchantedkingdom.com.ph or call 843-6074 to 76 or 830-2111 to 16.